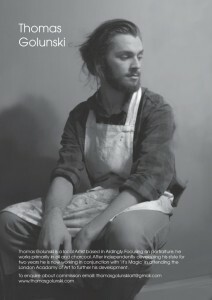 Tomas Golunski Aged just 22, Tommy has always had a passion for art; he started painting when he was 3 years old. Inspiration Family is an important inspiration to Tommy, particularly his grandfather, Mid Sussex artist Bill Golunski. Also contemporary painters Casey Baugh, Jeremy Lipkin and David Kasan as well as renowned American portrait artist John Singer Sargent. A selection of Tommy’s work can be seen by visiting www.behance.net/Thomas-Golunski. Education Tommy’s obvious artistic talent coupled with an iron determination to succeed has won him a coveted place at the highly selective Art Academy in London to study for a 3-Year Fine Art Diploma, starting in September 2015. “At the Academy we will be having 24 hour weeks, with art history, drawing lessons and sculpture. I’m super excited!” After his interview with the course leaders, they praised Tommy’s portfolio as one of the strongest bodies of work they had ever seen at that level. Funding With Tommy’s mother in need of long-term care, much of it provided by him, and his father working away from home, finding the funds for an arts education is proving an ongoing challenge. Fees for the 3-Year Fine Art Diploma Course are £6,493 per year. Government grants are not available. Some funding has been generously made available by Tim French MBE of It’s Magic, a charity that encourages and nurtures local Mid Sussex talent. Tommy will be part of It’s Magic’s music & entertainment event Last Wave on Broadway, held at Haywards Heath on Sunday, 30th August, where he will be exhibiting some of his work and also taking commissions. However, there is still some way to go to meet the annual fees, and opportunities exist for motivated individuals, community organisations and commercial companies to sponsor this talented young artist. If you are able to offer financial assistance to Tommy, please contact Tim French MBE at info@itsmagic.org.uk.